Must be Special Summoned with “The Fang of Critias”, using “Ring of Destruction”. Once per turn: You can target 1 card your opponent controls; destroy it. Then, if it was a Monster Card, inflict damage to your opponent equal to its original ATK. Destruction Dragon is the newest monster that pairs with Fang of Critias and it’s a darn good one. We had Doom Virus Dragon, Mirror Force Dragon, and Tyrant Burst Dragon, and two of those three were playable, now we’ve got Destruction Dragon. You need Fang of Critias and Ring of Destruction (a card still having playability in the meta). Destruction Dragon is better than Ring of Destruction since it got its text changed. A one-sided old school Ring of Destruction IF you choose to destroy a monster. You can destroy one card on your opponents field. While monsters are likely your target because they include the one-sided damage, Pendulum Scales, Field Spell, and face-down cards can garner your attention depending on your situation. Destruction Dragon doesn’t have much for ATK considering its Level, but it has 3000DEF, so sitting it in defense, popping a card and doing some LP damage if it’s a monster is pretty darn good. Gets a lower rating from me because, unlike Crush Card, Ring is Limited right now. You’d have to search the card out with another card, and have Fang of Critias in your possession just to summon this monster. Yes, Loop of Destruction counts as Ring of Destruction, but you won’t be running that. Destruction Dragon is a Level 8 Fire Dragon-type Fusion Monster with 2000 Atk and 3000 Def. The Atk is terrible, but it is low because it avoids the text “This monster cannot attack during the turn you use this effect.” Instead of that text, we get a monster that can destroy an opponent’s card once per turn. If that card is a monster, Destruction Dragon inflicts the original Atk as damage to the opponent. Ring of Destruction and Fang of Critias are required for the only Special Summon of Destruction Dragon, and the effect reflects the ability of that old Trap Card. Where Ring would inflict damage to both players, Destruction Dragon only damages the opponent. In a Fang of Critias deck, this would be useful because it makes that Spell more playable. In general, Ring of Destruction being limited really hurts this card’s playability. 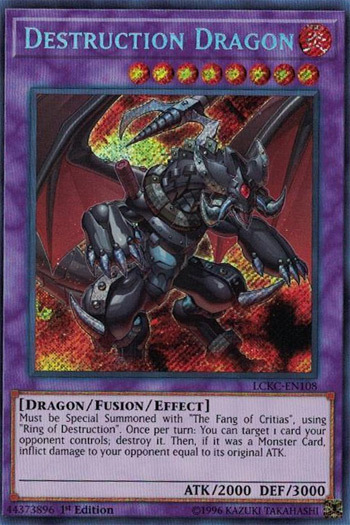 When I heard we were getting a new Fang of Critias Fusion, I was hoping it would be one for Ring of Destruction, and clearly we got it. Meet Destruction Dragon! Destruction Dragon is a Level 8 Fire Dragon with 2000 ATK and 3000 DEF. Stats are fine considering you are just giving up The Fang of Critias and Ring of Destruction for this, though I would of normally questioned 2000 ATK on a Level 8, but 3000 DEF is great. Type is the most supported in the game I believe, while Fire is one of the least supported Attributes. I already said you summon this with The Fang of Critias on Ring of Destruction, but know that is how you must summon it I believe, no reviving it once it dies. Just know we are also getting Loop of Destruction that treats itself as Ring of Destruction, we aren’t reviewing that due to the whole text not being revealed and a key detail being missing. Now for what Destruction Dragon does, once per turn you can target and destroy a card your opponent controls and if it was a monster they will take damage equal to the original attack. I would of loved to see this be a Quick Effect, but if Master Peace and Drident taught us anything, disruption like this being a Quick Effect is unhealthy for the game, especially since this burns as well. Overall, it is a very good card still, the only real limitation on this is the fact you have to use Fang of Critias and Ring of Destruction, and Ring of Destruction is still at 1 despite the errata. Still, another good Ciritas Fusion alongside Mirror Force Dragon and Doom Virus Dragon. Ahh, another Legendary Dragon Fusion eh? Destruction Dragon (hard as this is to believe) uses Ring of Destruction and The Fang of Critias. Dragon is good, as is Level 8, Fire is meh, but appropriate given all the Fire on the card art for RoD so whatever. 2000 attack is terrible for a Level 8, even a Fusion, even if the 3000 defense is nice. The destruction effect IS nice…being able to Target and destroy one card your opponent controls is no small matter, and you deal Damage to your opponent equal to the attack of a Monster destroyed with this effect (assuming you choose a Monster instead of a Magic/Trap card). I place this below Mirror Force Dragon but above Doom Virus Dragon. I see its attack as a problem, and while the defense is good, with no protection of its own, nothing stops an effect or stronger Monster from taking this down (even at 3000 def). I still do like this card despite my fairly critical review though.